Finding Common Ground… a Reflection on Outlander 4.4 – My Outlander Blog! It was perfect. After you begin to read this reflection you might not think that is quite how I feel, but please be patient and keep reading. I remember, very early on in the series, discussing the topic of this adaptation with a fan who felt that the show was missing the mark with how they were portraying the characters. I pointed out to her that the show had gotten the big things right. However, the nuances, small character traits, and pages and pages of internal and external dialogue that helped readers “know” these characters would be very hard to reproduce on the screen. I told her that the truth is we may never see “our” Jamie and Claire on our tvs. My observations were pretty prophetic. Here’s the thing. These two people on the screen are not the Jamie and Claire of the book, as much as I might wish that they were. I still like the Jamie and Claire I see on the screen, they are still characters I care about and the story is still a “ripping good yarn”, but it has somehow morphed into its own thing that resembles my beloved story, but is telling its own and I’m not so sure that that is not a good thing. I’ve finally come to accept that the two aren’t who I was hoping for, but there is enough “common ground” between book J&C and tv J&C for the story to feel familiar and watching worthwhile. It’s a good show. I can’t imagine the logistical nightmare of writing and producing for this story. First, you have committed yourself to making a show for both book fans and folks who watch, but who don’t even know or care that there are books. Then you have to make decisions about what part to tell and what part not to tell, many times related to the reality of filming and each of those decisions will have long reaching consequences that will affect other decisions. No one can make me believe that these decisions are made lightly or without love for the fans and story. There has been too much proof that they care throughout the seasons. There are a lot of hands in this pie each with their own ideas how this all needs to go down. I get frustrated when fans want to play the blame game because they truly have no idea who wanted what or why, some of the hands in this pie have more power than others. It is a delicate and intricate balancing act that sometimes they get right and sometimes they get wrong. I can imagine if we were somehow as fans given the chance to write and produce this story other fans would have the same issues with us. Everyone sees this story through their own lens of what is important. That being said it doesn’t mean that the show should be free of critique. They fooled me with the cleaning of the fish. I kept waiting for the comical attack in the books. It didn’t happen and I missed it. And, I think the show missed an opportunity to add in something their version of Jamie and Claire’s story has always needed. In my opinion, the tv version of the story has always needed more of the humor found in the books. It is part of the character development that endears Jamie, Claire and Ian to the fans and makes all that they endure bearable. I understood the scene change and how it moved the story forward. However, the lack of humor has made my experience with this couple less intimate and I feel less invested in their lives, as a result. The writers decided to take a more adversarial stance between the Frasers and their neighbors. It is perhaps a more accurate portrayal of what things might have been like. Last week, I read some fans’ critique of Jamie and Claire staring out over the horizon having found a place to call their own…someone else’s place. Here goes that balancing act again. Yes, it was native land and Jamie certainly should understand what it feels like to have land taken from you, but the reality is that Fraser’s Ridge exists and the place and its inhabitants are the bulk of the story going forward. Like slavery in America, settlers laying claim to Indian land happened and it is a reality written into the story and as such must be dealt with. The writers cannot be blamed for wanting to deal with that reality with some consideration. So, I’m finding myself watching the show differently these days and quite frankly, it’s a relief. Whether or not the show is like the book is becoming less and less important. What appears to becoming more important is the story that they ARE telling. This week, I thought they told a good story full of quiet character revealing conversations, heart-warming moments that actually made me tear up, and what’s going to happen next action (I really kind of like not really knowing). It was a quick hour of television and I found myself not wanting it to be over. Claire worrying about Bree was such a relief. I always wondered how that would not constantly be on her mind and to the show’s credit they keep showing us that she is and Claire really does struggle with her decision to go through the stones. They also show us that Bree isn’t the only young woman missing her mother. Marsali may not be 200 years from her mother, but she might as well be. It really wasn’t uncommon for young adults during this time period to say good-bye to their parents knowing they may never see them again. Hopping on a ship for a voyage across the ocean was a dangerous and arduous journey and one probably not taken more than once or twice in a lifetime. Jamie’s reassurances about Brianna were well meant, but cold comfort to a grieveing mother who regrets leaving her child. The scenes of the three Frasers clearing the land and the beginning of the first homestead on the Ridge were delightful as was our couple’s excitment and sense of pride. But, the scene that tore me up was Roger’s discovery of Jamie and Claire in America and his telling Bree. It was wonderfully emotional, Sophie Skelton and Rik Rankin were fantastic in these scenes. I could feel Roger’s wonder and delight and Bree’s relief and gratitude and the yearning they both had for each other. I love the change that puts all of their lives intersectioning on Grandfather Mountain. I love the idea that Bree could have been walking where her father had walked. I’m so excited about this new story line and relationship. Poor babies, I want to give them a hug! Our introduction to the Cherokees was beautiful, a feast for the eyes and senses. I have no idea how historically accurate the costumes and dances were, but I know the actors were First Nation and a lot of research was done. I was fascinated. John Quincy Myers assures us that the local Cherokee tribe strives for balance and peace and that bodes well for the Frasers. The “Bear Man” was unexpeced and I wondered if he was based on a true story or legend. The tribe banished him for taking a woman who didn’t want to be taken. The community could not of sent a clearer message to their warriors about how they value women. Hard not to make comparisons and wonder what defines a savage. I wondered if their treatment of this man didn’t foreshadow some things for our Ian. They could not kill something that was already dead to them. By the end of the episode, I came to understand that the show has in fact moved beyond the books upon which they are based. My beloved Outlander series of books will always be there and as always, I will enjoy immersing myself in that story and world. However, I now find myself immersed in a new story and world called Outlander. I love them both. I especially liked the way the highway on which Bree and Roger were traveling morphing into the trail being traveled by Jamie & Claire. Yes! they foreshadowed the direction they were taking when Bree shivered at fort William! Some of your questions about what is included (and not) are answered in this week’s ‘official’ podcast. For instance, the fish story (because of location) was (location-wise) impractical and although it was planned, it seemed a bit too silly when they went to actually include it. They did a good job with the podcast this week discussing how and why book incidents were modified/changed/left out of the TV episode. thank you, I’m sure a lot was answered…as I said I;m very late to the party! Claire on the screen and I have no issues with that whatsoever. There are as many versions of Jamie and Claire as there are readers. I have not read the books for some time, and I prefer to watch the show without that hanging over it. I’ve always maintained that this is a different version of the story, but one that, as you said, tends to get the “big things right” and follows the path of the books pretty well. I also agree with you about the people who make the show. I try to stay away from Diana’s FB page now, because there are too many people who seem personally affronted if things don’t go how they wish. I have no doubt that all the cast, crew, writers etc. put their heart and soul and LOT of hard work into making this show, and I have no patience for people who doubt that. If you don’t like the show, fine, just try to be kind anyway. It is best to never forget that this is a show that is telling a story derived from thousand of pages of words in a visual shorthand. And I’m very much on board for that particular ride. Thank you for your very valuable insights. 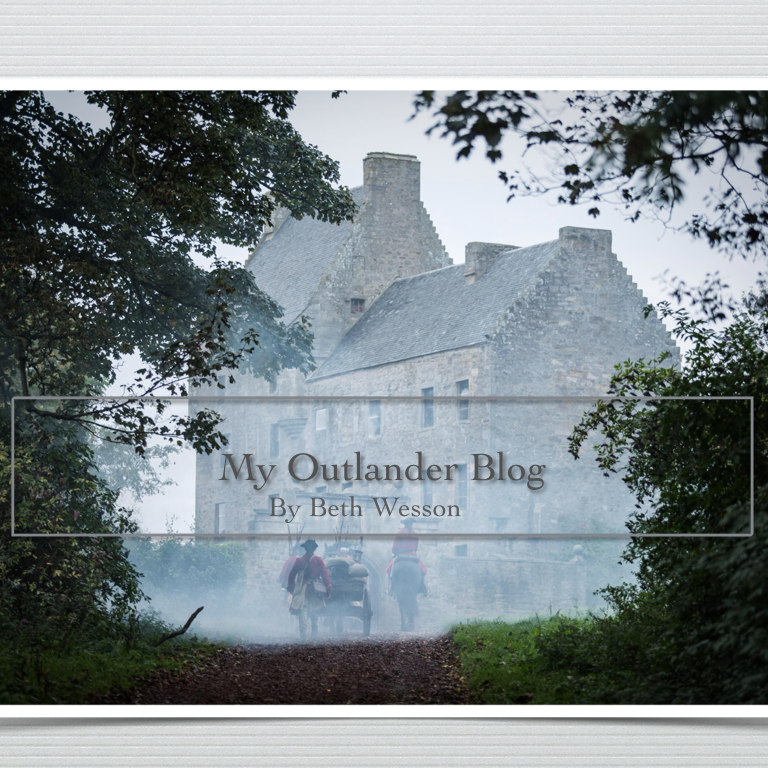 Your Outlander blog is the one I always look to for insightful reflections on each week’s show. I agree that the book and the tv show are two separate entitites and although I believe they are doing their best to retell the story that Dianna has given us, you are right Beth — the humor is definitely missing. No, these aren’t the characters I see in my mind’s eye when I read those wonderful books, but it doesn’t make them any less of a joy to watch on the screen each week. I’ve really pulled back from the FB pages I follow because, as one commenter here put it so well, people seem so terribly affronted when they don’t get exactly what they want from the original story. It’s disheartening to read and so often sounds like whining to me. I know the groups are there for discussion, but at times it seems so mean-spirited. I think this past week’s episode was the best of the season so far because we finally get to see them at what is going to be their home for so many years go come. They’re there at last! What a joy it was to see all of them working to build a life together. The Indians were truly a feast for the eyes as well and I really liked what they did with the bear-man. And then there’s Brianna and Roger . . . I can’t wait to see more of their story. Thanks Beth, for another excellent review of my favorite show. TY! I really appreciated your comments! Exactly how I feel and you worded it so well. I, too, am tired of the people that pick on svery little detail and are rude about it. I try to avoid those comments at all costs. I am loving the shows this season and this eps 4 rates right up there with a few other favorites. I loved i! Thanks, Beth. Spot on, as usual. I always feel your observations match mine exactly, only you know how to write very well! Beth, I hope you and your family had a BLAST at the Happiest Place on Earth! I assume you were in Florida, not California! You OWN those ears, girl! A very good looking family! Speaking of “happy places” I really enjoyed this ep! The structural changes made sense to me (and honestly, I totally forgot the fish scene until you mentioned it’s lack! Had to go look it up!!) and for me it was another good layer to the season! Roger was the highlight for me this week! I quite literally had tingles when he made his discovery and then shared the news with Bree. I think that Rik and Sophie are just crushing it and I can’t wait to see more! Until next week! I agree they are really are making Bree and roger great! Thank you Beth for a nice, positive review. I do agree the book and the tv show are different though they share a common heritage. Jamie & Claire, for me, first came to life onscreen and then I read the books. So for me Sam & Cait ARE Jamie & Claire. I do think there were a few opportunities missed that, with a little dialog, could have shown more passion and closeness between them with words alone. Overall this season is looking up. Unfortunately for the writers etc, this is a big book with lots happening, so condensing the story in appropriate places must happen and so far they seem to have chosen well. Hi! The task of condensing those novels is as enormous as the books, LOL! Beth—You always take an intelligent and sensitive position about Outlander book v. Outlander tv, and I so appreciate that. But aren’t you getting tired of all the complaints when tv doesn’t match book? We are 4 seasons along; why don’t people get it by now that the tv version cannot be a direct translation of the books, but strives hard to be a great interpretation of the books. Thanks for the thoughtful commentary. Some of us started reading the books shortly before the show aired. We know how rich they are but haven’t had time to re-read them, memorizing the color of every dress, type of fish Claire is filleting etc. I love the books but i love show as well. These actors have brought the story to life, twinkling eyes and crooked smiles too. I appreciate how much is crammed into every episode and the portrayal of this fiercely in love couple. I enjoy it immensely and wonder why others are so disappointed. Thanks JoAnn. I know that people love these books and characters passionately and as a result, changes can feel personal. Enjoyed your post as always, Beth, and agreed with pretty much everything (I don’t miss the humor in the books because that wasn’t an important aspect to me). As I’ve said elsewhere, this is my least favorite book, so when I’m not completely happy with what I see on the screen, I remind myself of that, and I thought the bear compromise was perfect. I loved the First Nations aspects much more than I expected to (the parts in the books sometimes dragged for me). And one happy surprise for me. How wonderful Rick Rankin is as Roger! His face as he spoke to Bree on the phone was achingly perfect. Thanks Randy! I completely agree about Rik! Thank you for putting an intelligent voice to the feelings I’ve been having since Year 4 began. They HAVE moved away from the original, and it’s taken me this long to let that slide. The two can co-exist! Although there are times when I want to scream at my tv… I’m trying ever so hard to accept that there are 1000’s of words dedicated to characters to make them come alive from Diana’s pages… and only seconds given to the same on the small screen. They must pick and choose that which they want to invest in…. that which will make THEIR story come alive. Those may not always coincide… and that’s ok… now. Loved this response you nailed what I was trying to say! Well, Beth, I’m happy to see you had a great trip! I really really really am grateful for this viewpoint. It is exactly how I feel I cannot find as wonderful a way as putting it as you have. Five years ago, I made a second attempt to read Game of Thrones. I had 4 vertebrae break in my back from taking warfarin (anti coagulant) and nomwarning from my former doctor. I was laid up and found that the people in these books were even more miserable than I was. Helped. Dark books. Then I watched the show. It went quite off the rails, eventually and made its own way. In that case I liked it as the show added a missing ingredient in the books. Humor. I say all this because you commented on, to me, the glaring fact that the humor (except for Young Ian) is missing in Outlander the show, is the humor of the books. Claire’s thoughts in the book will make me laugh out loud at times. And sometimes make me want to squeal with happiness at something she commented on. Her way of looking at life is beautiful. I so miss that. So, I, like you, have seperated the two entities and enjoy them separately. I love the actors. So well cast. There is only one thing I wonder. If one has not read the books, there are times when I’m not sure how they could understand what is going on as the background doesn’t exist. Sometimes. Anyway, thank you so much for this. I will enjoy the show even more now. You’re the best! ThanksJoan I enjoyed reading this! You are always my favorite Outlander commentator! Are you still at Disney? My son, daughter-in-law and special needs grandson (4yrs old) are at Disneyland today and tomorrow courtesy of the Make a Wish Foundation! Disney World, but home now! disney does such a great job with special needs kids and families! Sam makes Jamie Fraser absolutely come alive, from the beginning. His acting, facial expressions say things not spoken. Bree and Roger are doing nicely and look forward to their ‘arrival’. That is about all I can say.. I agree. I am an avid re-reader of the books. Sam truly brings Jamie come alive for me. As usual I agree with all your thoughts. I would like to double agree that Claire and Jamie should be enjoying life a little more, and have a hearty laugh and smile every once in a while. They have experienced a great many perils, but at least for the moment life seems good. So Jamie and Claire, give us a great big smile, and chuckle, please. Jomarie54 echoed my thoughts best. For me, when the bath scene in the cave at the monastery way back in Season 1 didn’t happen, I was left so very disappointed. But I got over it. And because there are so many pages, scenarios, people, books, fans, writers, actors, etc., etc, I will also just go along for the ride. And love all of it. It’s funny, not one person has missed Claire seeing the waterhorse from whenever that was. I thought the last episode was really great. I loved Bree and Roger. Going forward will be a pleasure. Best wishes to you, Beth. Your family vacation, I know, was a great one. Did you get to Epcot? I love that place! Hi Nancy! thanks for reading and commenting yes! Epcot is one of my favorites as well! First of all, let me congratulate you on such a nice family, i hope you had fun! Just today, i decided to get back in the books because i was missing my favorite characters, i like the show, no doubt, but, it`s as much as you say, more and more two different roads. I never mind knowing more landscapes. In 4/4 i especially liked the interpretations of both Sophie Skelton and RiK Rankin in a very emotional phone call, where what remained to be said transpired through the facial ritus of the actors, that neither of the two characters they interpreted, coud see. A feast for the spectatores, who thus, became their acomplices. In fact, it is not up to Outlander`s prodution to solve what is wrong in history. Both slavery and genocide are sadly traversed by humanity , yesterday, as well as today . It is up to them to treat these and other subjects of great complexity with respect and sensitivity, this has been achived in most cases. Bringing to the fore theses issues , strugging to do it in a decent way in an entertainment program, is, in itself, a great accomplishment. I Hope you can continue to give some of your valuable time to our benefit, because i follow your fan reviews with consideration and satisfaction. They bring me a sense of peace and balance. 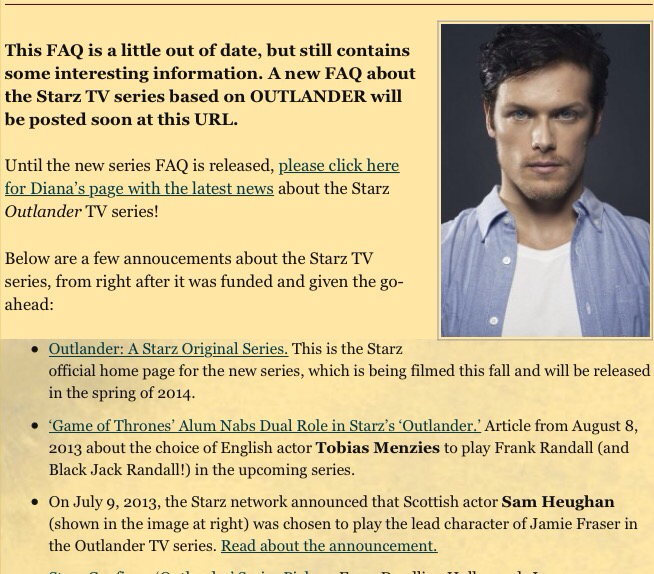 Beth, I’m beyond delighted to have found you the very first year of Outlander tv. Your insights and reflections are definitely appreciated and how I choose to see the tv version vs the books. I finally called it quits on fb due to all the insanity expressed there and the bashing that Diana endures. You are the one and only commentator I subscribe to. Life is too short to get your parties in a knot over tv vs books!! Just saying. Thank you. So glad you took time for yourself and family. Hi Connie ! Thank you so much for reading my blog. Your comments mean a lot! Beth, I just found you and really enjoyed your review. You make the same point that other have on Fraser Ridge. But I don’t agree that Jamie is taking the land. He has made a deal with the English devil. It is a land grant. I know all of the land was the Native Americans first, but Jamie did not run them off. The English did. Being from the south I have walked those lands , both the plantations and the reservation. Hi Lynn glad you found me! Thanks for sharing your thoughts! Glad you had a great trip Beth. I’ve never been to the “happiest place on earth” but it does look wonderful. Maybe one day I’ll go. I have finally managed to separate the 2 and I’m glad. I’m enjoying the show but truly wish TV Jamie & Claire had a little more humor in their lives. They don’t and TV Jamie will not be as strong as book Jamie – I accept that. Adding Claire bashing Jamie and the bear man on the head with a fish would have been great – I was so looking forward to that but I’ll live. I’m happy too with the way Roger & Bree’s story is evolving. I agree Sophie and Rik are doing a fine job. The issue of Jamie & Claire taking the Indian’s land without any form of guilt seemed to me somewhat hypocritical given that they had seen the Scots disenfranchised. Slavery and the mistreatment of aboriginals are heady topics but the show is addressing these issues square on. It is ironic the Indian explaining why the bear man was banished was accused of domestic violence in real life. My poor book hat is feeling totally neglected but I’m glad I’ve ditched it. My book characters are still near and dear to my heart but the TV ones are fun to watch. loved your comments! Exactly what I was trying ti say! Thanks for the great insight. It’s helpful to me cause I’m running out of interest in the show. I was always able to separate the book from the show and still was invested in show Jamie and Claire and their story. I have found Jamie and Claire seem weird and well just weird toward each other. They seem so cool towards each other until all of a sudden they are breathing deep. The face touching is annoying, I’d have my hands elsewhere if I were either of them. They seem to have lost their chemistry this season. I would have liked to have seem Jamie put some effort into chopping the tree, I’m sure Sam could have managed it. The Indians were lovely both the costuming and the men. They seemed believable to me unlike the rest of the cast. It’s unlikely I’ll watch anymore unless they can get their “act” together. Hi, I truly enjoy reading your thoughts on Outlander. I have cut back on much of social media due to rampant pettiness and general negativity, but that is wonderfully absent here. I agree that you have to separate the books from the show. A book is always better, there is more opportunity to flesh out the characters, have exposition and use your imagination. My Jamie and Claire are different because my experiences are different. I started watching between season 1A and 1B and immediately started reading the books. I easily picture Sam and Cait as Jamie and Claire because that was my introduction to the characters. Subsequent characters I imagined differently, not better or worse, just different in my minds eye. The but it is nuances of the writing that draw you in. Television is simply a more visual medium not incorporating the individual perspective. They cannot be spot on for everyone. They should be enjoyed for what they are, books and a television adaptation. As a side note regarding the Cherokee, the dance they showed is a traditional dance of the bear. We traveled through the Smokie Mountains and North Carolina this past summer. One of our stops was a living museum on the Cherokee reservation. We met some wonderful Native American re-enactors and learned a lot. The history is fascinating, there is so much glossed over in our (my) history education. I’ve probably rambled too much. The biggest takeaway is I love reading your perspective and the positive nature of all your followers. hi! I’m glad you enjoyed my reflection and glad you took the time to comment and yes my readers are great! Great review, as always. I read the books long enough ago that I don’t remember many details. I’m purposely waiting until end of each season to re-read the corresponding book. That way I can enjoy the show on its own merits. We are blessed to have two outstanding versions of the same story. I have only recently discovered your blog and I am enchanted. I find that I am waiting impatiently for the next edition. I have read the books from the 90’s and have loved Diana’s words from the start. I hesitated to watch the series as I doubted that it could do justice to the books. But then I fell in love with the characters and reread all of the books over the last few months. I wonder how much is lost for those who haven’t read the books. I try to tell fans of the series that they would enjoy it so much more with the background of the books but so many have no interest. Their loss. I love both and I so look forward to reading your thoughts. Really enjoying your very well written blog posts Beth. I am very much in tune with your reflections on the TV series of necessity being very different from the books. Since watching the first season I have read through everything that Diana has written and her writing is incredidibly gifted. However, I stop reading (or re-reading) once each new season is aired because I want to enjoy the TV series for the great production it is. Interestingly my husband isn’t a book reader yet and enjoys the TV episodes as much as I do without knowing any background. I try not to say what may be happening from the book point of view to keep it ‘clean’. He thought the last episode was extremely well done and very dramatic and of course had no problem with the bear or fish issues because he took the film version on its own merits. He enjoys Jamie’s sense of humour which we both think comes across quite well. Sam’s facial expressions and Scottish humour is a great contrast to Claire’s English earnestness. Thanks for your time and energy in writing this blog – :). I don’t think I’ve read your blog before but very much enjoyed it. I agree this is a different version of my beloved Outlander and my enjoyment of it has increased greatly since I’ve let go of the book version and just enjoyed the TV version. I agree completely that they’re getting the big things right and I can always go to the book version whenever I want. (Rereading ECHO currently 🙂 I love the show too though and am just so happy at all the effort that goes into the show. Thank YOU for the time & effort you put into this blog! So glad you’re finding, as am I, the delight in both and some “Common Ground” of appreciation despite. I look forward to your thoughts every week! I very much liked reading your balanced reviews last year but admit I had forgotten all about you until the email pinged into my inbox. Again, I am enjoying your reviews. On the whole this season has been great – there are always parts you can wish they had written in a different way, or included well-loved words. I agree with you about the humour though, that has been lacking and sometimes the antagonism is over-egged. What I think happens sometimes, with both the writers and the fans is that they are thinking of Claire in terms of a 21st century woman. She was not – she was born at the beginning of the 20th century, grew up in the thirties, qualified as a nurse in the 40s and practiced as a doctor in the 50s. A very different time for women than those born in the 21st century. I should know – I was born in the 40s. Sorry that’s rather long-winded but I think for the above reason Claire sometimes is given words and actions that are out of character. I don’t get to see the new episode until Monday so am keeping clear of spoilers until then but look forward to reading next week’s review. Excellent viewpoint. Excellent. Claire and her time(s). Beth, had you been at TTS this weekend, listening to Ron & Terry’s talk, you’d have thought “he’s repeating everything I said in my blog!” It was interesting to hear him break down how they develop the season, and how they are visually telling a story. It’s the same overall story, told in a different way, and yes, they make changes to tell the story visually. He talked about Outlander being from her perspective, and that other perspectives come into play, and the need to show what Jamie’s doing, while Claire is thinking about something. It was really interesting, and gives me a new appreciation that he hasn’t torn his hair out yet. I’m sorry I wasn’t and thank you for sharing!